Retail Price: $17.95 Log in for LOWEST PRICE! This selection comes from a winery founded in 1999, with a story beginning in 1952. That's when Ben Volkhardt Sr., a San Franciscan, purchased some farming land outside of the big city. He decided on an 80-acre fruit orchard filled with peach and pear trees and a four-acre vineyard. Ben slowly replanted the orchard over the next 20 years, creating a quaint family winery, Volkhardt Family Vineyards. Grapes were the family business for three generations, spanning over 50 years. 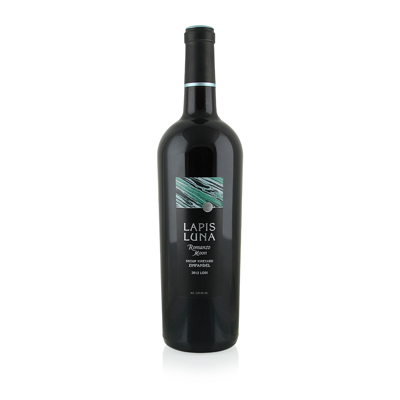 In May 2005, Green Valley Vintners, LLC, acquired the winery and vineyards, and renamed them Lapis Luna, which means "stone" and "moon." Our selection is an exotic blend of 85% Zinfandel and 15% Sangiovese grown in Lodi, California. It may be the first time we've tasted these two grapes in a blend, and it is nothing short of spectacular. What works here is that, though the grapes were born on different continents, they have similar flavors and, thus, complement each other instead of arguing. The result is a seamless integration of strawberry flavors harmonized by Sangiovese's spice and earthiness. Now, with six years of age, it's beginning to show its pedigree.